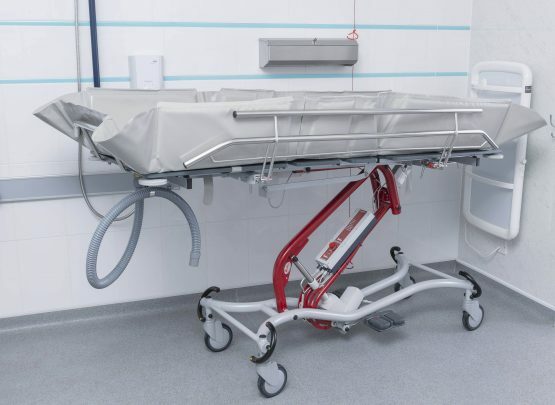 The Stabila Ergo Shower Trolley is a mobile solution that allows easy transfers from a bed to shower room. 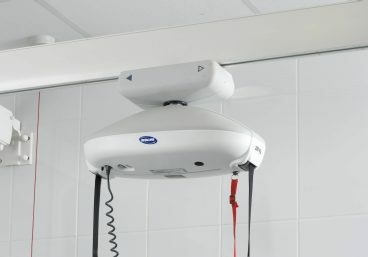 The 4-profiling action enables carers to easily arrange individuals into the positions they find most comfortable for showering, including upright seated. The padded mattress and head rest also provide additional comfort. 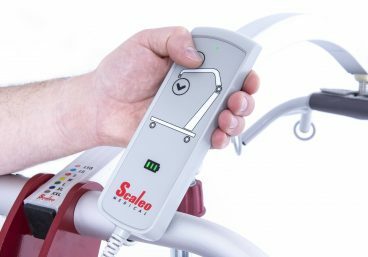 Features such as ergonomic handles and height adjustment controls enable carers to work comfortably and efficiently, without the need to compromise on safe posture. 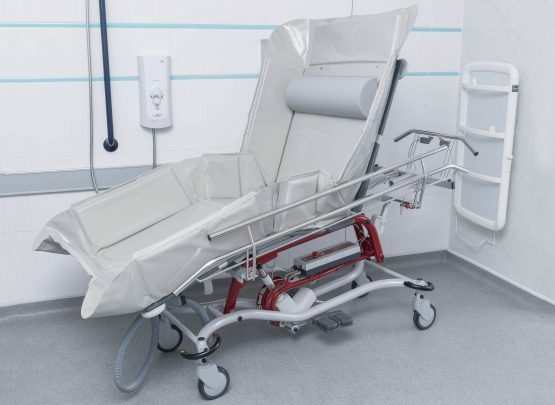 The Ergo’s highly flexible design and safety components make it suitable for people living with disabilities or learning difficulties, who are typically being supported in a professional care environment. The Ergo is also suitable for care at home. 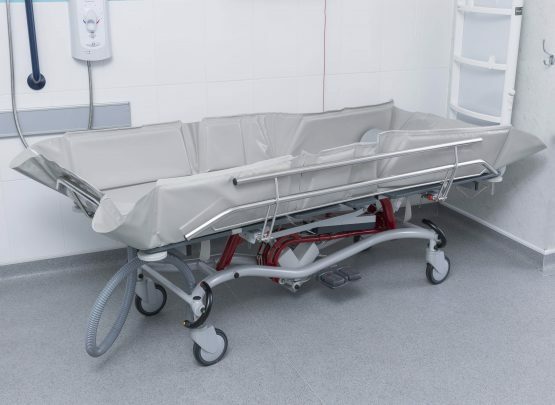 When transferring a patient from a bed to the trolley, the side rails can be lowered completely for a smooth side transfer. 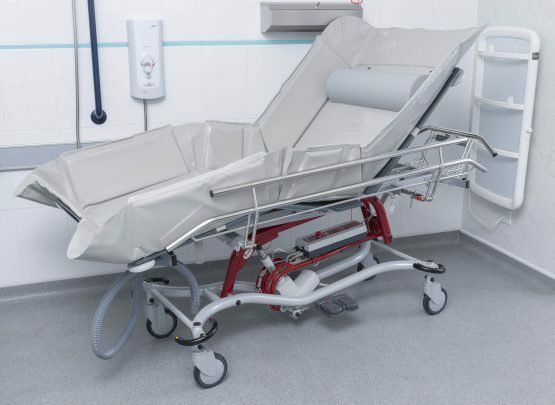 Alternatively, if a hoist is being used, the profiling action of the trolley’s mattress reduces the need for repositioning, as the client can be lowered from a sitting position in the hoist, into a similar sitting position in the trolley. The profiling action is also ideal for clients who cannot tolerate lying flat – if, for example, if a supine position causes breathing difficulties, the client suffers from neuropathic pain, or has an atypical body shape or resting position. The upright position can also be beneficial for clients who suffer from anxiety, and the knee-brake action can prevent clients from slipping down the trolley. The tilting function provides efficient draining. Alternatively, by using the plug, the trolley can be effectively used as a bathing trolley with shallow water. 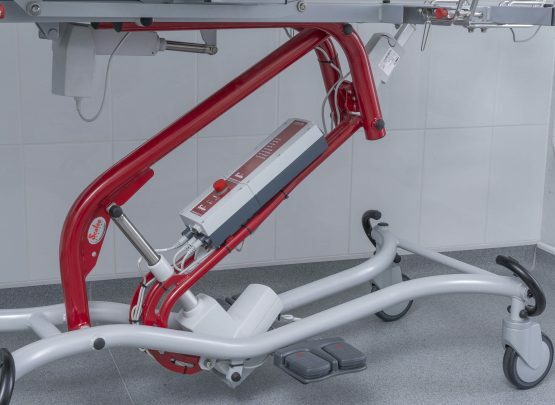 For professional carers, the height adjustment provides a comfortable working environment – reducing the need for bending – and making the process of showering and personal care more efficient. 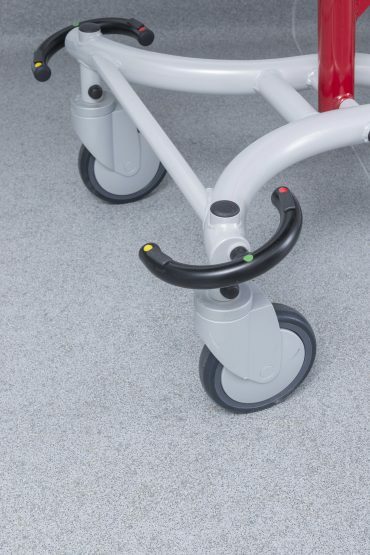 Ergonomic handles make the trolley easy to manoeuvre, and simple removal of the liner makes cleaning the frame a quick task. 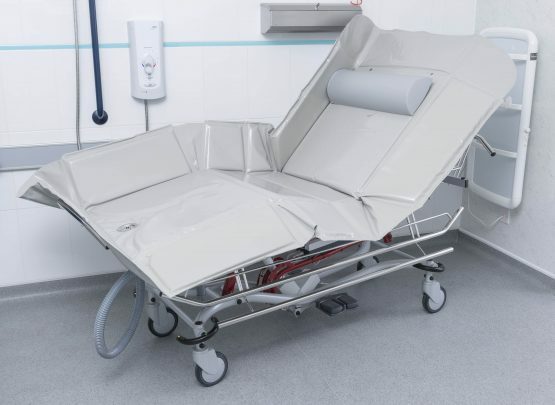 The Stabila Ergo shower trolley shares the same features and high build quality of the Stabila but offers a fully profiling mattress platform for more complex care needs. 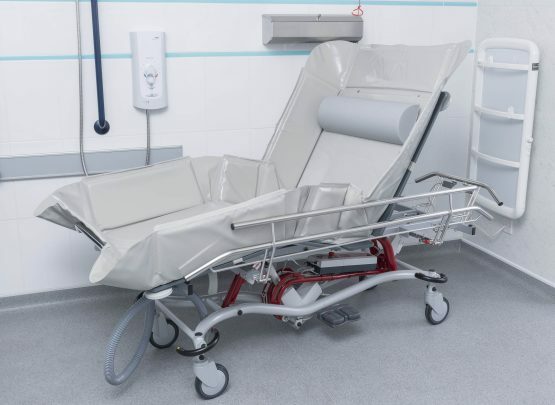 A carefully optimised seated position, along with high siderails, maintain a secure position for the user and prevent sliding. 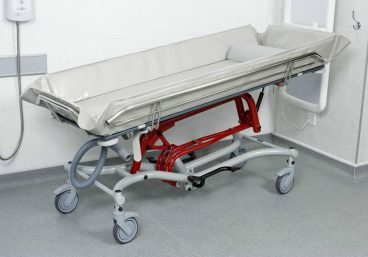 Retractable side rails allow for safe, easy transfers. Anti-Trendelenburg (tilt) function allows effective drainage.